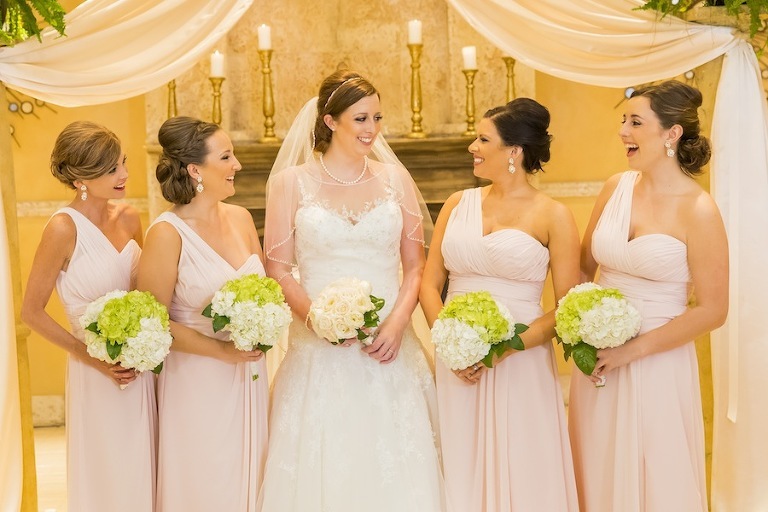 Emily and Jason’s elegant blush pink and gold Tampa wedding featured all white flowers and lots of candlelight to set the mood of their traditional wedding. The Land O Lakes couple kept their wedding local, to be close to family and friends. To keep their wedding planning streamlined, the pair chose all-inclusive Tampa wedding venue A La Carte Pavilion. Music was important to Emily and Jason, and they valued their wedding guests’ feedback on the playlist. What were the deciding factors for choosing A La Carte Pavilion? 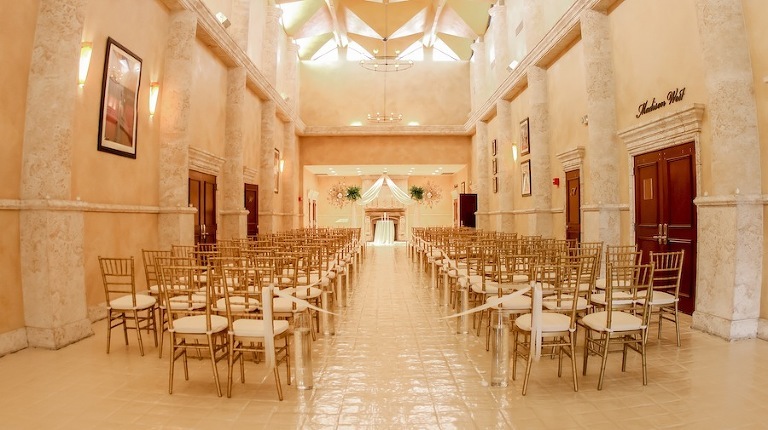 The major selling point of the venue was the ceremony space. It gave the allure of a large, cathedral style church without having to have our guests transport between a church and the venue. Another special feature that we were fond of was the room we selected being attached to the large outdoor space right on the water. We knew we didn’t want a beach wedding but being able to have a little bit of “traditional” Florida was also important, so the space was the perfect balance. Our most favorite aspect was that it was a one stop shop! 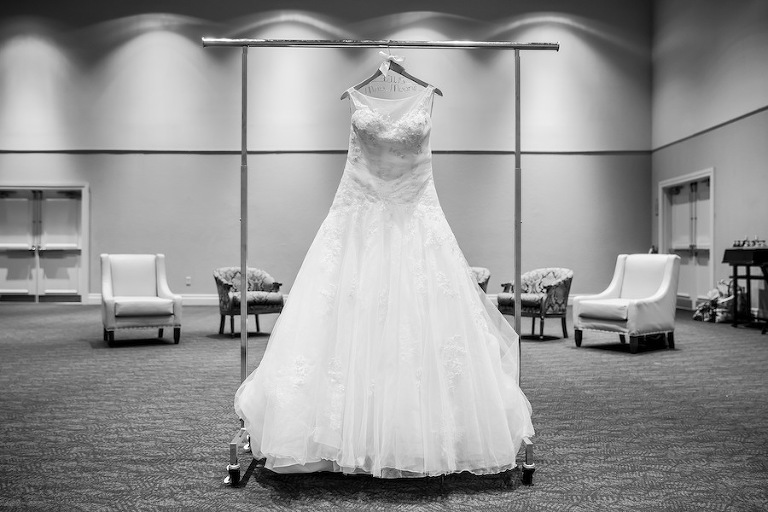 Everything except our DJ and our photographer/videographer was taken care of through A La Carte: linens, place settings, décor, draping, lighting, floral, catering, the bar, and the planner were all included in our package. Our day went off without a hitch and was perfectly organized and timed from start to finish. It was such a wonderful experience and completely non-stressful! Everyone involved was able to sit back and enjoy the day and not worry about a thing; it was truly perfect. In June 2014, Jason and I were on vacation with my family in Destin, FL. Two days before we were supposed to head home, Jason and I decided to spend some time together just the two of us. We drove to a beach further from the house and spent the whole day lounging on the beach and drinking cocktails from a little shack. Towards the end of our little excursion, he started mentioning the sunset and how pretty he thought it would be from the boardwalk downtown. He mentioned that he had looked up a restaurant down there that looked like it had the traditional types of seafood that we had been looking for the whole trip. The whole time we were driving, Jason was grumbling about the time and how if we don’t get there and finish dinner by 7:45 p.m., we would miss the sunset. Well, to say the least, his plan was thwarted, as there was a wait at the restaurant and the sun was swiftly setting. He mentioned that we probably wouldn’t make it to the beach for the sunset, so we should just walk to the end of the boardwalk and watch it from there. After dinner we walked to the end of the boardwalk and sat down to watch the sunset. We chatted a bit and I could tell, though he would disagree, that Jason was fidgety and a little “off.” As I stood, Jason didn’t and as I turned around to find out what on earth he was doing, there he was, on one knee! I immediately burst into tears as he made his speech, and of course I said yes! To my own surprise a rather large crowd had gathered and were cheering; a street saxophone player started playing and cheers erupted from the crowd. The best part, complete strangers took pictures and sent them to us! It was absolutely perfect. Traditional elegance. It was important to us that the décor not overwhelm the space, and we really wanted to use soft colors to accentuate the room at the venue. Since our room was attached a large outdoor patio, we wanted to use the natural colors of the spaces. Blush pink was the primary color with gold as the primary accent. We stuck some shades of green in the mix because it was March and green is Jason’s favorite color. We pulled that color in with the guy’s ties and in the menus and programs. We also had all white florals and alternated low florals and high glass cylinders with lily grass on the guest tables, and we flooded the room with tea candles to soften the light in the room. Have a planner! It honestly was the greatest thing to be able to trust our planner to handle the day and make sure that everything went off without a hitch. Don’t shave your legs until the morning of. If you’re getting ready in a hotel, wear a pair of your soon-to-be husband’s socks because you WILL be freezing cold. Take the time to frequently look around you and take in the moments. All of these people are surrounding you with love and want to celebrate your commitment to each other, do not let that go without acknowledging. Also, do a first look with your dad (and brothers if you have them). Without a doubt that was one of my most favorite moments, and it really helped curb my emotional jitters before walking down the aisle. As a crier, it was important for me to get out any “ugly tears” before the ceremony!